• Comes with garnishes for a complete meal experience! • Just add 450ML of hot water. Wait for 3 minutes, stir and enjoy! Get yourself a bowl of new MAGGI® HOT MEALZ™ Kari Kari Kaw and feel the punch till the very last slurp! Springy noodles made with Australian-sourced wheat grains combined with the curry soup packed with 12 spices blended and infused with paprika oil, mix in with garnishes to make it a truly 'kaw' experience. Simply open, add 450ml of hot water, chill for a bit, and enjoy. What are you waiting for? Get one today! 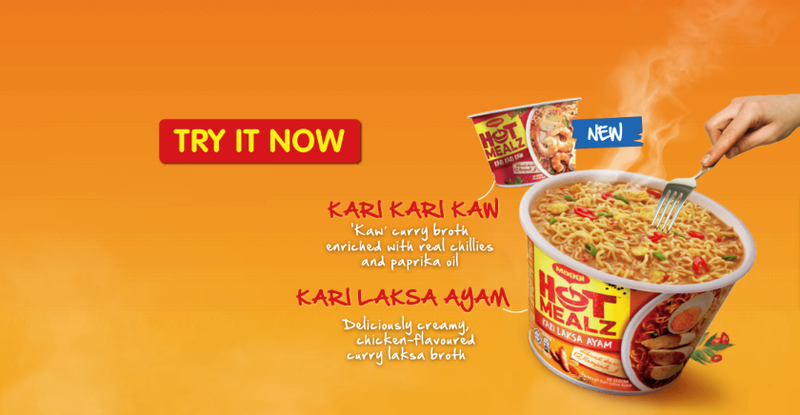 Get yourself a bowl of new MAGGI® HOT MEALZ™ Kari Laksa Ayam. A bowl of springy noodles made with Australian-sourced wheat grains in a creamy chicken-flavoured curry laksa broth blended with 12 spices, mix in garnishes for a complete meal experience! Simply open, add 450ml of hot water, chill for a bit, and enjoy. What are you waiting for? Get one today!